The 13th-century castle of Bottmingen is the only preserved water castle at the Leimental. During 17th and 18th century, the water castle was converted into German and then into a French Baroque style. As a result, the park was also layed out as a Baroque garden with orangeries and rearranged as an English Garden during the 19th century. Already in 1887, the restaurant and one big hall were established. Today the listed castle is a coveted, historical event location with elegant rooms and provides space for all sorts of events. 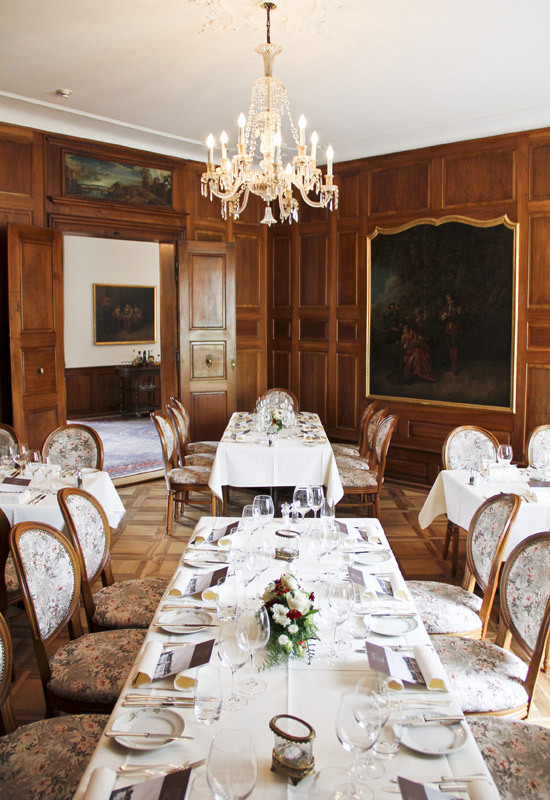 A wide selection of rooms is available for your dignified event – the in white kept “Steinsaal” (up to 42 people), which provides access to the terrace, impresses with its splendid rococo style. The room of mirrors (up to 24 people) is at the first floor and offers a beautiful view of the lake. The biggest festival hall is the impressive knight’s hall (up to 145 people). It is placed on the second floor and is suitable for unforgettable festivities with music and dance. Your business occasion of any kind – from a small meeting to a big corporate party – will find an elegant setting in one of the five event rooms at this historical location. Enjoy the relaxed atmosphere and experience the excellent gourmet kitchen with your guest during your business event. After a work-filled session, you could walk through the romantic scenery of the park and collect new ideas. 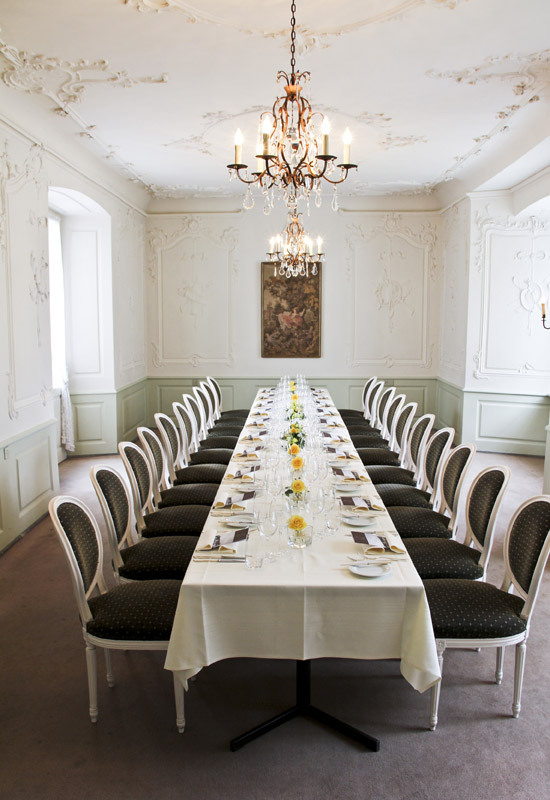 The conference rooms “Baslersaal” and “Täflersaal” are particularly suitable for an effective conference for a group of approximately 34 people. 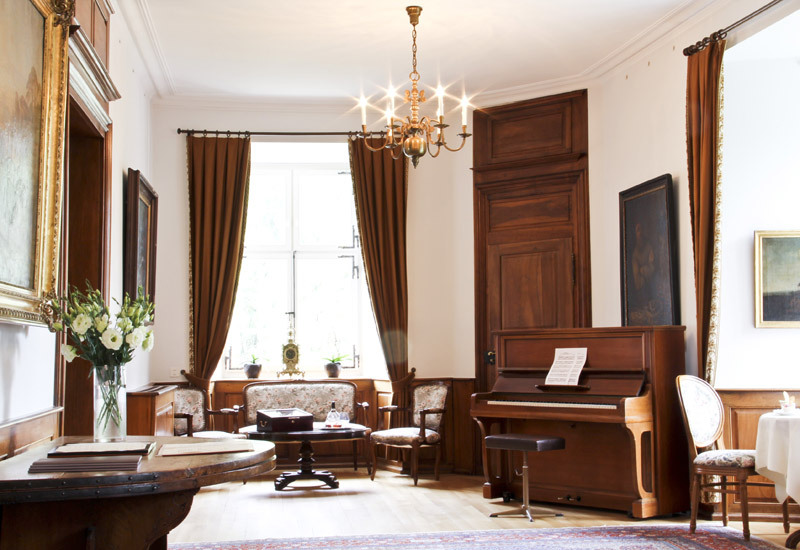 In the quaint rooms, which can be accessed via the hall, you can find original wood panels and elegant chandeliers. 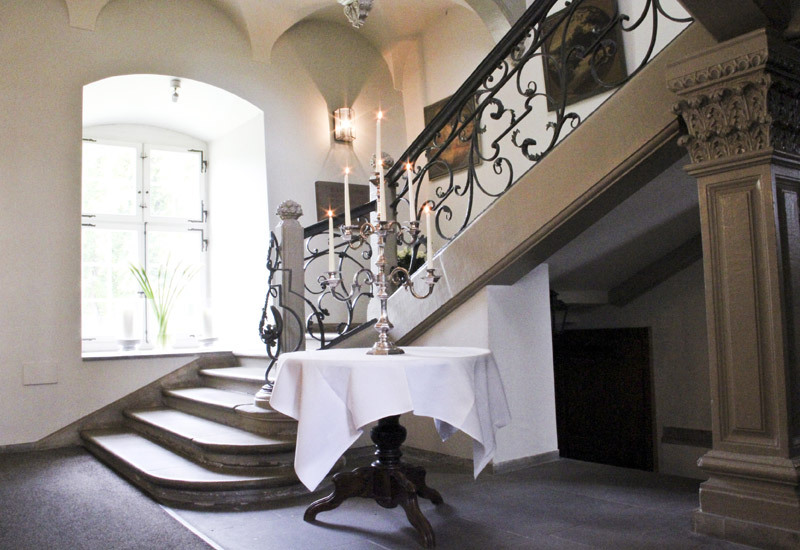 The elegant hall could be also used for an aperitif with your guests. In the hall of mirrors of the water castle, you are able to consummate the marriage in the presence of 20 guests and celebrate afterwards an outstanding celebration with up to 145 people at the knight’s hall. 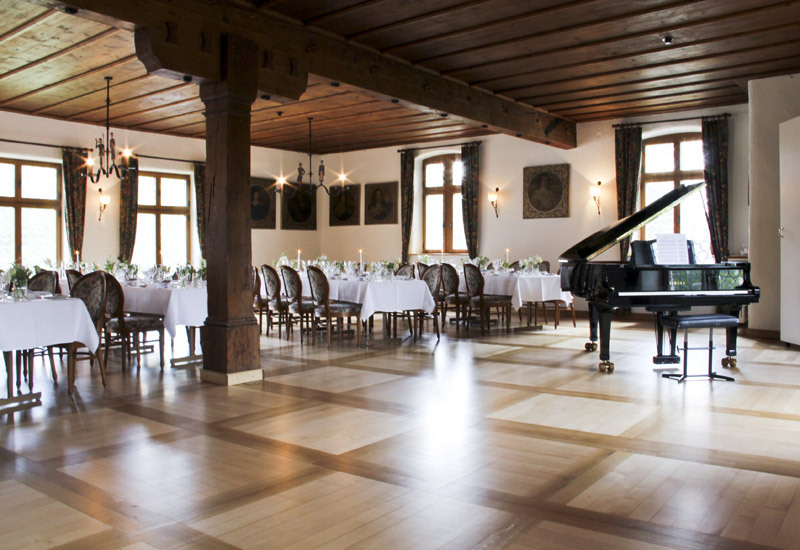 Smaller wedding parties are welcome in the “Steinsaal” with its magnificent setting. The magical water castle offers many romantic photo shooting settings on the inside and outside of the building. 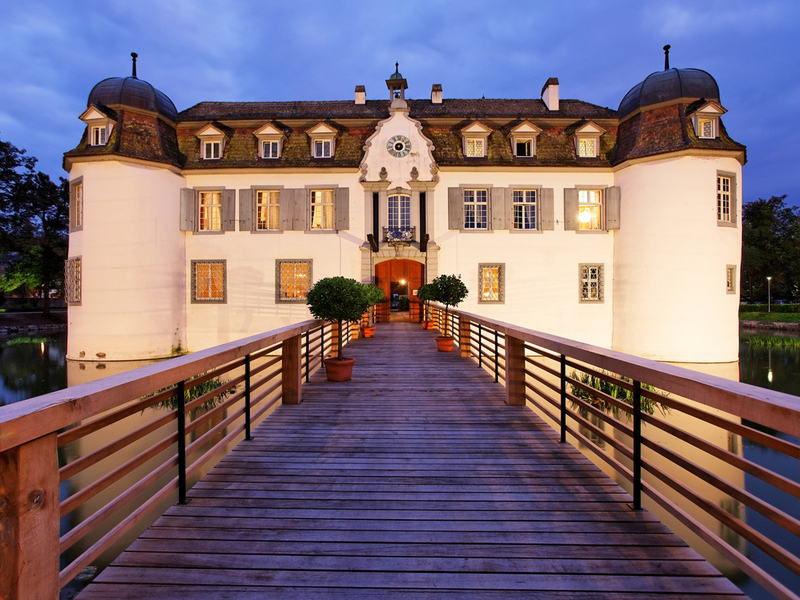 During your event, you will enjoy culinary delights of the classic French cuisine at the castle of Bottmingen. Experience a lunch or dinner out of seasonal and local ingredients on the highest level – just created for you. You can also order a wedding cake at the in-house patisserie.